Our flight was on 1st December and catapulted Clemens, Marinus, Johannes and me from our local Christmas season right into the centre of Mexico's capital, where there was also lots of Christmas decoration but when walking in t-shirts through the streets, dominated by a very relaxed atmosphere in contrast to the stressful European Christmas season, we weren't in a festive mood at all. Everybody involved in the project was happy and relieved that this time we could complete the project, after the first attempt six months before had failed due to the fact that a Mexican government agency had cancelled the permit for the closure of the air space on short notice. They didn't want us to fly a drone above the city, which we had intended to use for the connecting line. Even Altius Events wasn't able to interfere. They don't do anything else but organize events and had invited us both times. 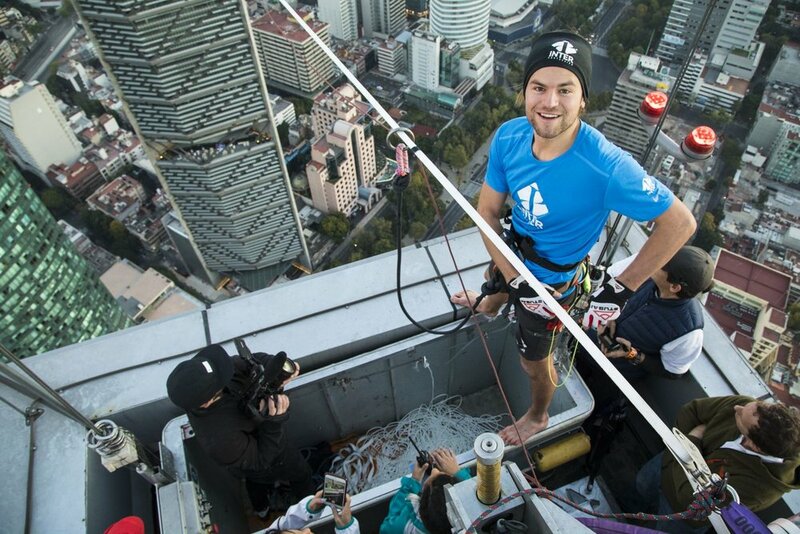 So all we could do was to make the connection the classic way: the first part - dropping ropes from both skyscrapers - was as easy as expected. It became more exciting when we had to organize the connecting line next to 30 meter high trees and finally across the six lane busy main street („Reforma“) without the line getting caught anywhere. We were allowed a time slot of only 20 minutes at midnight during which the Reforma was blocked from traffic. While I was trying to focus on the walk on the next day, my team of three finished the connecting line in no time with the help of Mexican rope specialists. Afterwards they pulled across and rigged the whole highline set-up. We all had to get up at six o'clock the next morning because I was allowed to try the line for a few minutes at sunrise to get accustomed to this unique highline. After some catches I felt quite good and was motivated for later on. 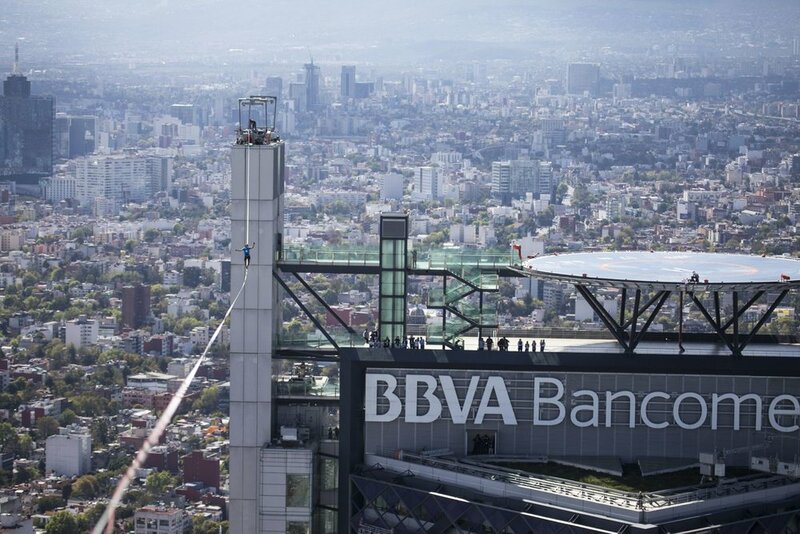 So we had a good breakfast and were back on Torre Bancomer at 9 o'clock. I tried to relax in a 30-minute yoga session on the second highest spot of Mexico city as best as possible while the helicopter was already hovering above ready to broadcast LIVE. Such a big event, timed on the minute, puts enormous pressure on you. Everything depends on just you now! What makes the situation mentally even more difficult is the fact that I was expected to cross the line at the first attempt. Anyway, after my first fall already after 10 meters this stress factor was eliminated! At my second attempt I got a lot further, but I found it extremely difficult to balance the movements of the line, also because the white dyneema webbing was virtually invisible against the light gray background. I could hardly see half the line! I fell. As fast as I could I slid back to the beginning. After Marinus had reduced the tension of the slackline at the other side a little, I started again at once; it felt better but nevertheless, I didn't manage to persevere for even a third of the line. This realization helped me to relax inwardly as much as reducing the tension of the slackline a few more centimeters helped me externally before I started my fourth attempt. With the adapted tension and a much more chilled mindset everything went way better than before, but the line still was everything else but stable and required my full presence and utmost precision. Shortly before the middle I felt that walking quickly the thin air affected me. I forced myself to walk more slowly and to focus on the present moment; I realized I had to fight against being distracted, neither by the thought of walking through nor by what I would be saying in front of the cameras later on, nor by the helicopter, which crossed my field of vision again and again. From the middle onwards I managed to concentrate fully just on the movement of the slackline and my body. It is that extremely deep state of mind of flow what I like so much about slacklining! I was really careful during the last meters as I didn't want to fall at any price. Because of the height difference of eight meters between the anchor points, the line was too steep for me to walk the last 10 meters. So I carefully sat down and made my way to the edge, where my team, Altius and the representatives of Interproteccion (sponsors of the events) congratulated me. At once I was caught in the middle of a media frenzy, which monopolized me for the next 30 minutes. Although this was very stressful, I also enjoyed talking about my recent experience thus remembering it even better myself.